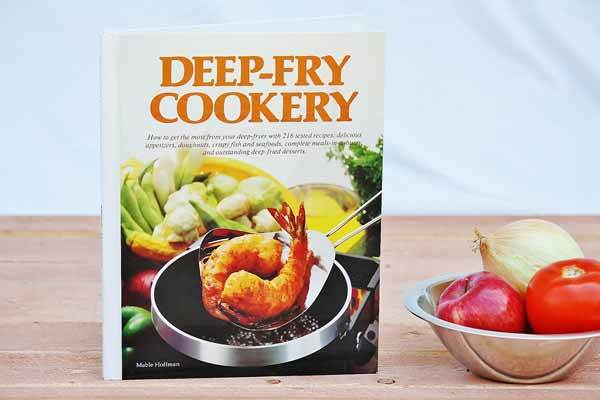 It's easy to go beyond french fries with Mable Hoffman's exciting new book, Deep-Fry Cookery! Discover a fabulous variety of delicious foods you can prepare in your Presto Deep Fryer. This 160-page, hardcover edition contains more than 200 tasty recipes and over 75 beautiful, full color illustrations. Each recipe is fully tested, easy-to-read, easy-to-follow, and delicious! Crunchy vegetables, tasty appetizers, nourishing meats, perfect poultry, seafood, and pastries are all included. Discover the mouthwatering crispness of deep fried Shrimp Rolls and Chicken Almond Croquettes. Enjoy sensational, tender doughnuts fresh from your own kitchen. Make your own crispy-coated fish that brings them back for more. There are many more golden goodies like breads and desserts! Detailed directions tell you everything you need to know about deep frying. Learn how easy and enjoyable it can be and discover the secret of perfect frying every time. Impress family and friends with new skills and recipes! Full-color, step-by-step illustrations show you how to make Mini Mandarin Drumsticks, Butterfly Shrimp, Chicken Kiev, Corn Dogs, Zucchini Fritters, Funnel Cakes, Rosettes, Cinnamon-Apple Rings, and more! You can't go wrong with these outstandingly delicious meals!